Your tenure is drawing to an end. You have one year and three months left before you are required by law to step down for another successor. How has your second coming been? What is important is what we have made of time spent. We have demonstrated leadership by example. We have made ourselves accessible, accountable and respected by our people. If not for God and my achievements, my enemies would have gone the whole hog to attack my person. Because my people believe in me, I came back into this office based on my previous performance – during my first term as Ekiti State governor. My people have given me the trust and cooperation to serve them. Thus, I’m happy that we have made credible achievements and impact in their lives. What are the most memorable moments for you as governor of Ekiti State? One of them is the trust that I have enjoyed, even in the face of being a prominent opposition figure. The people have shown me love beyond my imagination. One of the things I want to be remembered for or that we have done differently is stooping to conquer. Let me tell you, even if you have 50 years in office, you cannot finish it all. You keep working and giving your best to the people. It is only God that can acknowledge your performance. We will never finish serving and there will always be a desire in an economy. Where you are managing poverty and trying to meet the expectations of the people, you have to continue trying. What would you say are your strengths and weaknesses as a leader? Anybody can have money but it is not as important as the openness and the access enjoyed by the people. We mingle freely and allow people to have free access to us. That has given us more support than we can imagine. I sincerely appreciate the cooperation of the people. I’m a mortal. I’m not infallible. Sometimes, we get angry and, sometimes, we do things the way people don’t understand. But we retrace our steps in line with the will of the people. There is no perfect man, so I can’t claim that (to be perfect). I have only decided to be humble. Today, anybody coming after me has a lot to do to be trusted by the people because the stakes are very high – the people know what they want. It is no longer about the roads we have tarred; schools and markets we have built or other infrastructural development we have brought (about); it is about our personal relationship with the people. Your role in the current administration of President Muhammadu Buhari and Acting President Yemi Osinbajo places you as the spearhead of the opposition. Why did you take on such a responsibility? Like I always say to people, life is not about your personal attainment of goals and aspiration; it is about being counted for the people. If you don’t stand up for something, so many things will stand up against you. Some people say it is because I enjoy immunity. What about others that enjoy immunity? A lot of leaders today are afraid of speaking the truth. But I know there is no gain without pain. We stood in the gap for the people. I am the longest-serving governor. I served under former President Olusegun Obasanjo with the likes of Asiwaju Bola Tinubu and former President Umaru Yar’Adua – then, former President Goodluck Jonathan was a deputy governor. I later served under Jonathan when he was the president and now under President Muhammadu Buhari. I have traversed many administrations and worked alongside some of the gladiators in Nigerian politics today. I’m an experienced man. At different times, I have made contributions to the development of Nigeria. As an opposition figure, I’m truly expected to give the government of the day a run for their money. I must make them give value for the votes given to them. The opposition is an integral part of democracy; without that, you have autocracy. Someone has to be the voice of the people in this trying period because we cannot all see things the same way. The government must be put on its toes at all times and be made accountable to the people. Can you speak more on the warning you gave to Nigerians that you ‘put life and death’ before them as regards voting for Jonathan or Buhari in the 2015 presidential poll? I’m a man that enjoys God’s grace. The Bible says before I was born I was in my mother’s belly, God knew what I would be. I’m the man God wants me to be because God gave me a woman after his heart knowing my limitations, my excesses and my pains. Beyond politics, we are different people before God. Things some will do and get away (with), some will do and never get away. I have gone through so many challenges, but today, I’m still standing. 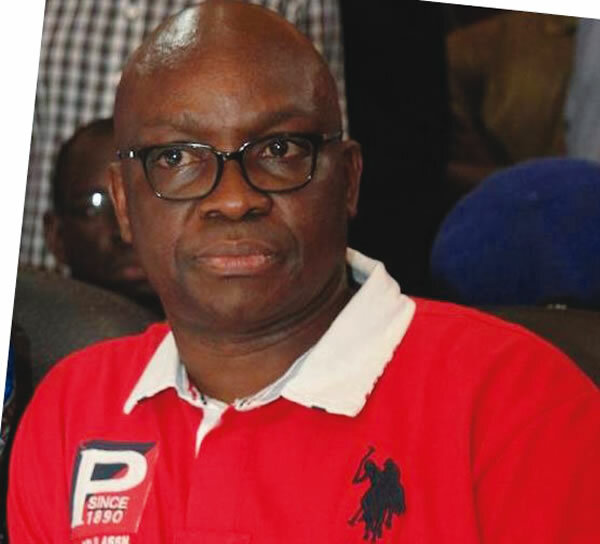 Many thought that by the time Buhari got to power, Fayose would be dead. That is not a democracy. We are not afraid of battles; we are not afraid of saying the truth. Moses, Joseph, our Lord Jesus Christ and Prophet Muhammad (SAW) stood in the gap to stand up for the truth. For me, there is no personal issue between me and the President. But I want to establish that I was a young man when he became the (military) head of state. I watched him closely with his deputy, Gen. Tunde Idiagbon. So, I was a young man who saw tomorrow and never shied away from narrating the story. I said repeatedly that President Buhari did not have the capacity to rule Nigeria and I did not hide it. Concerning all that I have said so far, I have no regret. I always say the abundance of a man does not consist of things he possesses. Life is not in the realm of what you have achieved and what you have not achieved. Generations come and go. Everything I have said will come to pass. Our president is very old to rule. We wish him good recovery but not to return as president if he does not have the health to back it up. If I said the President was not well at the time, it has manifested. We will continue to pray for him. Anybody can get sick but one must be honourable enough to say when he doesn’t have the capacity to continue (to serve the people). As the only Peoples Democratic Party governor in the South-West, do you see yourself at a political disadvantage in the region? Former Governor Bola Tinubu was the only opposition governor at a time in the South-West. Today, by the cooperation of other stakeholders in the All Progressives Congress, they conquered Nigeria. I’m going to lead the opposition to conquer Nigeria like Tinubu did. The fact that you are in the minority does not make you lesser than those in the majority, in terms of wisdom, understanding, God’s backing and hope for the future. Recently, South-West governors, including you, came out to form an alliance. How will this work with you in the opposition? Our working together for the good of South-West has nothing to do with politics. Everyone needs to contribute to the growth of this country, so is this region. It doesn’t matter the party I belong (to). They are only saying we should stay together in terms of security, agriculture and have peer review. Hunger does not know political party. People want good roads, water, services, etc. There is no way party politics will make me not to cooperate with my colleagues in the South-West. You said you have 11 damaging photos to prove President Muhammadu Buhari’s health is deteriorating. How do you feel when governors and aides close to Buhari are saying the President is recovering? about his health status. If you listened to the Ebonyi State Governor (Dave Umahi), he said it was a miracle that the President recovered. If something is a miracle, it means that what I said about the President’s health was the truth. With due respect, everything I have said is the truth and remains the truth. The fact that one is placed on life support does not mean that the person cannot recover. But the question should be: does one have the health to continue with rigorous work of office? Do you think you should have been included on the list of governors invited to the United Kingdom to see Buhari? I’m indifferent. Nigerians wanted me to be there. But I believe in the judgment of my colleagues. If Nigerians wanted me to be there but they (Buhari’s handlers) didn’t give me the access, what can I do? I have to move on and join them to wish the President well. What is important is Nigeria. When Senator (John) McCain was sick in the United States, he came out boldly to say he had a brain tumour. The health of the President is a public issue. It is the handlers that are causing the confusion. Like I said, I don’t want the President dead, but we want to know the true state of health of our president. For me, I’ll love to go there (the UK) to see (him). But if they say they are not giving me a passage, it is all well and good, as long as the President is hale and hearty. If he is not fit, let him resign. Why do you think the presidency failed to include you on the list of the latest visitors to Buhari in the UK? The President denied drawing the list, saying it was the governors’ forum. I’m not desperate to go there. If they feel it is important I represent – if not, I’m still an opposition figure. Many people are not comfortable with me and I don’t blame them. They may feel I would want to come and tell Nigerians what actually transpired there. But I cannot lie; I can’t say what is not true; I can’t make up things. I can’t celebrate lies. That does not mean that my colleagues that went there are lying. What we are praying for is that the President should get well. Do you have any personal relationship with President Buhari? If you have the opportunity to meet him, what will you tell him? I will wish him well – and that, if he is not fit to continue (to rule the country) he should resign. What else would I say? Everything I have said, I will stand by it. The offices of the president and governors require a lot of energy. Whatever interest we represent, we cannot deny that. Our adversaries – our opponents – know that we are saying the truth. But because they are the beneficiaries of what is going on, they will defend it. But I’m not afraid of speaking the truth. Truth heals and endures. You said you are the next president. If your prediction comes true in 2019, don’t you foresee a heated polity? I never predicted my presidency. I have a right to contest and I said I will contest and I will win. When I predicted that I would come back as governor of Ekiti State, many people doubted (my prediction). But because man has no capacity to see tomorrow, they can write you off. Those who wrote me off then see me in the position of authority today. When I was down the valley, they thought I would never rise. But the Lord said in Psalm 23: ‘I will set a table before you in the presence of your enemies.’ In this country, I’m going to the (Presidential) Villa. I’m saying that, by the special grace of God, those who doubted me today will visit me in Aso Rock as the president or the vice president – as the case may be. What is the next step for the PDP, now that its two-year crisis seems almost resolved? We are holding a non-elective convention on August 12 to work and extend the tenure of the (Ahmed) Makarfi National Caretaker Committee to give us a structure that will take us to the next level. What do you think is the solution to herdsmen’s attacks on farmers? We have the prevalence of certain crimes because they are being aided by the powers that be, either in the security agencies or otherwise. The moment the system is functional, a lot of crimes will disappear. Everybody knows the consequences of their actions and knows the system will not shield them. We should stop aiding evil in this land. Are you in support of regional government? I’m in support of strengthening the states. I’m in support of devolution of powers from the centre to the region or the states. As it is currently constituted, the centre is becoming dictatorial. They want to tell you what to do in your state, but we are all federating units and should be respected in line with the constitution. You have identified with Nnamdi Kanu, someone who was accused of openly seeking money abroad to buy weapons to fight against Nigeria. Why? I’m not aware of that fact. But let me say this, you are presumed innocent until proven otherwise. That is what the law says. Saying Nnamdi Kalu is this or that is prejudicial and unfair. I don’t believe in the disintegration of this country, but I believe in the right of Nigerians being respected. Agitation is normal. This country belongs to all of us. They should pay attention to the dwindling economy, poverty ravaging the land and hunger. Recently, you called for sanctions against Senator Ali Modu Sheriff and his group. Don’t you think this will further polarise the party? Sheriff has no followers! That is the truth. Sheriff is a hijacker; he is an impostor. Every system must have discipline. If today, Sheriff and his co-travellers had succeeded, they would have expelled people like me and the Rivers State Governor, Nyesom Wike. There must be discipline in the system. If there is no discipline in a system, one is wasting his time. These are characters that are used to scuttling truth and justice in our land. That was why I regretted supporting him initially. We should sanction them. I don’t believe in politics of lies (no winner, no vanquished) – that is a political statement. Going forward, the party must sanction some people. What about factions loyal to him in Ekiti, Ondo, Edo and others? There is a lot of make-believe. Let the people in Ekiti come forward and tell us they are members of Sheriff’s group. They have taken to their heels and we are going to discipline them. A few of them that are enemies of the party, we will expel them. The moment they don’t show remorse, we will expel them. Sheriff should be expelled. Sheriff, by his action – if you see the peace that pervaded this country after the (Supreme Court) judgment, you would see that there is peace without Sheriff. If it had gone the other way round, many people would have left the PDP. Nobody has left the party after Sheriff lost the judgment. You once reportedly worked against the interest of Senator Ahmed Makarfi when he aspired to be president. Today, you fought to ensure he is the chairman of PDP’s National Caretaker Committee. What changed? I never worked against Makarfi. I only said Obasanjo set up a committee and asked us to choose the presidential candidate. I was with a former Rivers State Governor, Peter Odili; others were with Makarfi. But Obasanjo told me that Makarfi would never be president of Nigeria and that I should not work for him. That is all. At the end of the day, Obasanjo moved against Odili. He knew his intention and ambition before he gave us that order. Why have you been attacking former President Olusegun Obasanjo at every opportunity you have? I’m not attacking him. I’m only saying things I know about him because I’m a living witness of Obasanjo’s life. I worked with him and know that Obasanjo is a sadist, an opportunist – a man who would rather put a weakling in position (of power). How would he ask Yar’Adua that he knew was sick to be president? I wonder why some media (organisations) celebrate Obasanjo. Obasanjo has no character. Obasanjo was the first president that trampled on our constitution in all ways using brute force. That is why Obasanjo does not have a (foot-) hold, in terms of human beings, in party politics in the South-West. Obasanjo is only left with the clout of being a former president. When you say human support, Obasanjo does not enjoy such in the South-West. What are the things you did for and with Obasanjo then that, if given a second chance, you would do differently? At the time I was the governor, I was a young man. I was avoiding Obasanjo because he was from the same zone as me. One thing I have known is that Obasanjo will run away if you can stand up against him. Obasanjo is a weak man; the moment you can stand up against him, he will chicken out. Look at Orji Uzor Kalu and late governor of Niger State. At that time, I couldn’t stand up (against Obasanjo). I have now found out that, sometimes, it is good to confront monsters. We are guided by the constitution and respect for the rule of law. Obasanjo messed up by disobeying the rule of law and removing governors at will. As a Yoruba man with respect for tradition and a beliefs that elders should be respected, don’t you think it is time to forget the past and move on? Elders are only meaningful when they are using their grey hair to lead the people well. Please, let us call a spade a spade. I don’t want to talk about people who are not elders by standards expected of them and (who are) not living by examples according to the true grace of their age. You only respect grey hair when the man is upright. Obasanjo is not a man to be respected; he is an opportunist. Former Governor of Ekiti State, Segun Oni has joined the governorship race. Are you threatened by his ambition? Former Governor Segun Oni is an Ekiti son and is entitled to aspire. Because I came back as governor, some people want to try their luck. Former Governor Kayode Fayemi is there; Senator Babafemi Ojudu is there too. Let them get the party ticket first. There is clamour by the Southern senatorial district to have a shot at the governorship. What is the position of your party on this? No position. We will not zone. The best candidate will emerge. With the second tranche of Paris Club refund and the expected federal allocation, how many months’ salary should workers expect? This Paris Club refund cannot pay one month’s salary. It is money between state and local governments. The state’s salary is N2.6bn, while local government is N2.4bn, which is N5bn, and I got N4.7bn. Capital projects are there. The Federal Government has politicised it. My own is that I will declare what I get to my workers and we will discuss it together. No matter what, the Paris Club refund cannot solve the entire problem, but it will augment it.